Portrush is billed as being the most popular holiday destination in Northern Ireland, a bold statement but one that the town can easily live up too. The location of the town itself is spectacular, situated as it is on the peninsula that extends out for over a mile into the Atlantic Ocean, on Northern Ireland’s most northerly coast. Ocean views can’t help but be impressive and they stretch out as far as the Causeway Coast across to Scotland and then to the beautiful Donegal Hills. This is a town that has something for everyone from excellent beaches to vibrant night clubs, as well as everything else in between. As if the attractions of the town weren’t enough, Portrush also makes a great base for touring around this part of Northern Ireland. The Giant’s Causeway is perhaps the biggest tourist attraction in the region but there are also plenty of other attractions on offer such as the Old Bushmills Distillery which is also a big hit with visitors. Get out and about and pay a visit to Dunluce Castle which sits upon a rocky crag upon the coastline. The castle fell to the British in the 16th Century and is a great place to take the kids for a castle themed adventure day. Coastal Zone is a bit of a mix between a sea life centre and a museum as it tells the story of the local marine habitat and how the sea has shaped the way that people along the coast lived. There is also an indoor rock pool feature as well as two large tanks full of marine creatures, plus a viewing platform from which you can get the best look at these creatures of the sea going about their business. 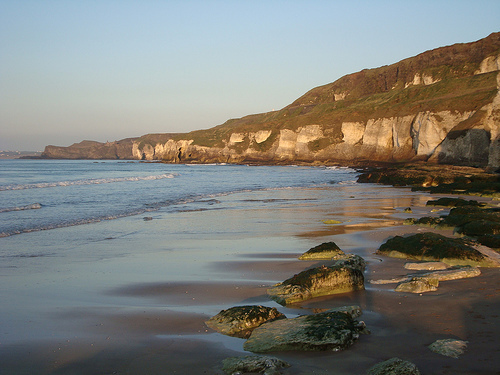 Alongside the marine centre you will find the Portrush Nature Reserve, an area of natural rock formations that provide us with some understanding of how the world was made, there are many fossil imprints here and it is a fabulous place to indulge in the Earth Sciences. Rock pools never fail to amuse the children and time can be spent here at low tide exploring the mini ecosystem which exists within each pool. Plus you can always spend your time enjoying the great outdoors here and making the most of the fabulous scenery that surrounds you. If the outdoors is your thing you may want to join in with some of the outward bound activities that are on offer, or for those with more solitary pursuits in mind there are a number of spots that can provide inspiration enough for any artistic or creative passion. There really is something here for every age group whether they have a desire for adventure or feel the need to be pampered with some world famous Irish hospitality. The glorious Atlantic coastline makes the perfect backdrop to any number of activities and offers a multitude of photographic opportunities to provide you with permanent reminders of your time here.